Hanssens Artisanaal | Beer Apprentice - Craft Beer News, Reviews, Interviews and Info. Hi guys. For today’s craft beer review I’m going to be trying the Hanssens Artisanaal Oude Gueuze Lambic produced by Hanssens Artisanaal bvba located in Dworp, Belgium. I happened to be in the mood for something sour and thought that this beer might do the trick. I couldn’t find a website for the brewery, so I’m going to head on over to ratebeer.com and see if I can find some sort of commercial description for this beer. 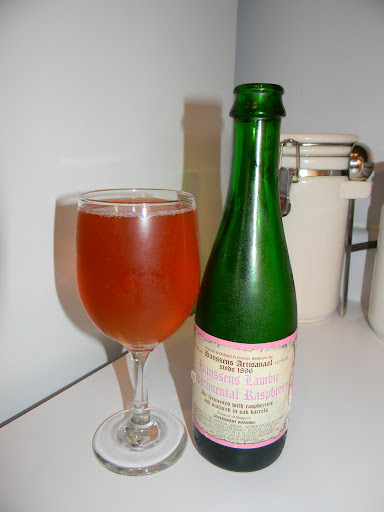 As with all Gueuzes, Hanssens is a mixture of several vintages to produce a lambic which is refreshingly fruity. This is the result of blending different lambics of different ages. The second fermentation takes place inside the bottles and therefore they are stored for minimum six months in constant temperature kept cellars. Well….. it’s time to drink. 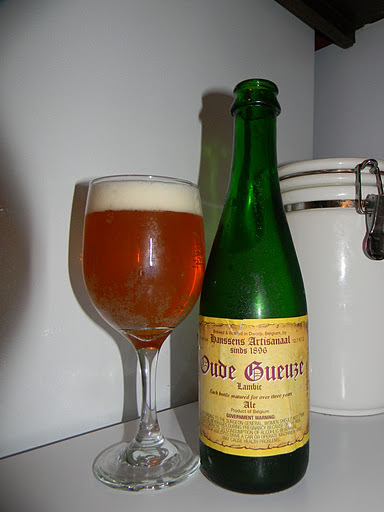 This Gueuze Lambic had an ABV of 6.0% and it came in a 12.7 oz. bottle. The brew poured a semi-clear, pale orange to dull gold color with a barely off white head that was compact, sturdy and of average size. The retention was only “so-so”, but the lacing was adequate. After a few minutes however, the cap dissipated and left no trace of its existence. The nose had a VERY pungent sourness and tartness to it. Hints of green apples and very stout, white grapes along with a profound bit of the funk and “barnyard” persona. A slight vinegar redolence was noticed and as the brew warmed some subtle spices came forth to add even more intricacy. The flavor was more of the same. Lip puckering bitterness, tartness and sourness. Very funky and musty with tons of that “barnyard/horse blanket” type of attribute. It was tremendously acidic due to a tart lemon and very sour green apple savor. The spiciness seemed a little more subtle in the taste, however that could have been because I was so taken aback the sourness. No matter, it still had a tremendous flavor I must say. It definitely woke up the taste buds that’s for sure. The mouthfeel was a palate killer. Medium bodied, very sharp and very biting. It left a copious amount of flavor behind on the roof of the mouth and the tongue. It would be, most likely, nearly impossible to taste anything immediately after having one of these. Man this is a very, very good Gueuze. It’s super pungent and aromatic. It does take awhile for the palate to adjust to the explosion of flavor, but once it does, it becomes very enjoyable. It has all of the proper “goodness” of a Gueuze Lambic. Tremendous amounts of soured and tart fruit along with that nice acidic punch. If you favor this style of beer, don’t pass it up. However, if you are interested in getting started with this type of beer…. it may not be the one for you. It’s pretty potent. For me, it’s not an everyday drinker, although I do find myself craving a “Sour” way more often than I used to. I will definitely give this another go round sometime in the near future. Have you guys had any offerings from Hanssens Artisanaal? If so, what did you have and what did you think? Feel free to leave a comment if you wish. Thanks for reading guys. I hope you are finding the reviews enjoyable. I have many more to come. Until next time.